Preaching This Week commentary, All Saints C, WorkingPreacher.org, Luther Seminary, 2016, 2013. 2009. This Week at PreachingIllustrations.com, 2015. Social Justice Lectionary, Bruce Sweet, 2015. All Saints' Day, Comments (commentary) and Clippings (technical notes for in-depth study), Chris Haslam, Anglican Diocese of Montreal. Girardian Reflections on the Lectionary, All Saints Sunday Year C, by Paul Nuechterlein & Friends. Saintly Vulnerability,David Lose, ... in the Meantime, 2016. Blessed Are You Who Are Poor, Janet H. Hunt, Dancing with the Word, 2016. This Blog is (NOT) about Marriage, William Culpepper, 2016. "A Generous Dispenser of Divine Mercy: The Canonization of St Teresa of Calcutta", Dan Clendenin, Journey with Jesus, 2016. Saintly Robe Fitting? Thomas Beam, 2016. "All the Saints," Greg Carey, ON Scripture, Odyssey Networks, 2013. "Losers," David Lose, Dear Working Preacher, 2013. Preacher's Study, William H. Petersen, The Associated Parishes for Liturgy and Mission, 2013. "Blessed Are..." Janet H. Hunt, Dancing with the Word, 2013. Just Plain Saints, Thomas Beam, 2013. I Kings 19:1-18 (All Saints, 2013), (Narrative Lectionary) Rob Myallis, Lectionary Greek, 2013. Care for Creation Commentary, Tom Mundahl," Lutherans Restoring Creation, 2013. "Saint Who? Saint YOU!" Pastor Sharron R. Lucas, The Stewardship of Life Institute, 2010. "For All the Saints," David Lose, Dear Working Preacher, 2010. Grounded & Rooted in Love, Laura and Matt Norvell, 2010. Remembering All Saints, Bruce Epperly, Patheos, 2010. Luminous Wisdom of Night: Reflections on All Saints and All Souls, Christine Valters Painter, Patheos, 2010. "Get Well Card," Deacon Sil, 2016. "Small Acts of Love," Nadia Bolz Weber, 2013. "The Blessings of the Saints" the Rev. Marshall Jolly, Sermons that Work, Episcopal Digital Network, 2013. "She Went On," Nathan Mattox, Morris, OK.
"Saint Carlton Is Lowest," the Very Rev. Samuel G. Candler, Day 1, 2010. All Saints Sermons, Pastor Edward F. Markquart, Grace Lutheran Church, Seattle, Washington. Spiritual Friendships, the Rev. Glenn Ethridge, Day 1, 2010. Worship Resources, 24 after Pentecost / All Saints, Rev. Mindi, Rev-o-lution, 2013. Worship and Liturgy Resources, All Saints, by Rev David Beswick, Uniting Church in Australia. Liturgy for All Saints' Vigil (Halloween), Rev. Bosco Peters, New Zealand. Liturgical Resources by Rev. Thomas L. Weitzel, Evangelical Lutheran Church in America. Prayers of the People, C - All Saints, General intercessions for Sundays and Feasts, by Ormonde Plater, Archdeacon of the [Anglican/Episcopal] Diocese of Louisiana. Lector's Notes, All Saints, Gregory Warnusz, Saint Jerome Parish, Bellefontaine Neighbors, MO. Notes and commentary for those reading this week's lectionary texts to the congregation. Outside the Box: Totenfest, litanies, poems and prayers written for the local church, by Katherine Hawker. "Liturgy: prayer reflection", reflections on the collect at the Eucharist, Rev. Bosco Peters, New Zealand. Thematic, Intercessory and Scripture Prayers for the RCL, Vanderbilt Divinity Library. Sunday Prayer for All Saints' Day / Proper 27C, MomPriest, RevGalBlogPals, 2010. The Timeless Psalms: Psalm 149, Joan Stott, prayers and meditations based on lectionary Psalms, 2013. HermanoLeón Clipart, All Saints. Free clipart, backgrounds, slides, etc. 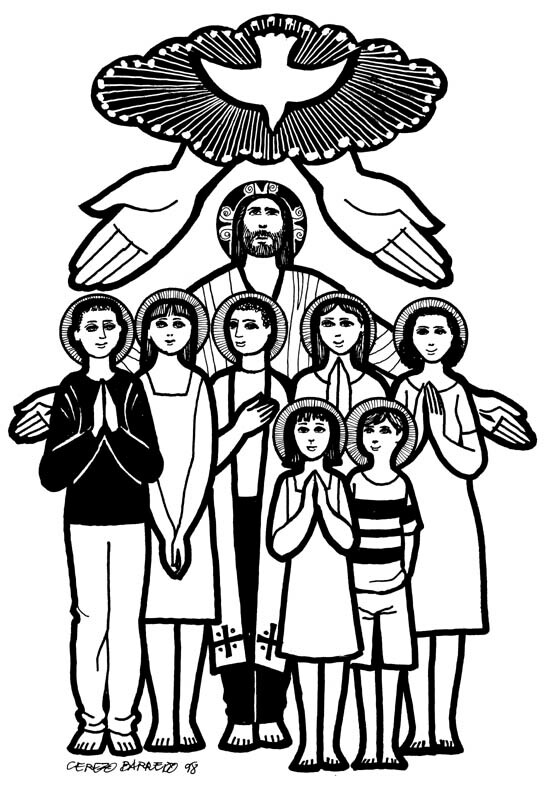 All Saints at Cerezo Barredo's weekly gospel illustrations. Follows Latin American Roman Catholic gospel reading. Liberation emphasis. "I Believe (The Apostles' Creed)," Carolyn Winfrey Gillette, AUSTRIAN HYMN 8.7.8.7 D (?Glorious Things of Thee Are Spoken?) The hymn based on the Creed celebrates "We're surrounded by God's people, saints who in our Lord believe." Shepherd Sounds, All Saints C. Background information for hymns and choral music following the lectionary from the Episcopal Church of the Good Shepherd, Austin, Texas, by Eric Mellenbruch and David Zersen. Worship Resource Manual, The Moravian Church, Southern Province. Worksheets for planning music in worship: hymns, anthems, solos, organ repertoire suggestions for RCL texts. Direct link to All Saints' Day. Choral Anthem Project, All Saints C, National Association of Pastoral Musicians. Sing for Joy, All Saints A, 2007. Choral reflections on this week's lectionary readings, St. Olaf College. Together to Celebrate, All Saints, 2013, David MacGregor, Uniting Church in Australia. Contemporary Christian Music resources. Worshiping with Children, All Saints Day, Including children in the congregation's worship, using the Revised Common Lectionary, Carolyn C. Brown, 2013. Talks to Children, All Saints. Object lessons by Rev Donald McCorkindale, Church of Scotland, et al. Lectionary Puzzles, All Saints. Word search puzzles in RTF or plain text, by Reg McMillan, St.Stephen's Presbyterian Church, Peterborough, Ontario.